Southern Tasmania? A snap. 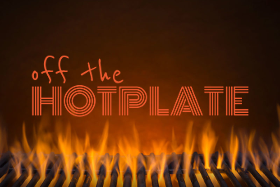 Sandy and Damon from Houston, USA, are devoted foodies and seasoned travellers. Their friends, Kirstin and Simon contacted me through my blog when they wanted to explore the foodie delights of Tasmania. How small is the world now, thanks to the internet and Southern Tasmania was on the radar? Kirstin had an unfortunate visa hiccup, and so it was Sandy and Damon who descended on Hobart, caught up with me for some drinks and a debrief, and then hit the road. 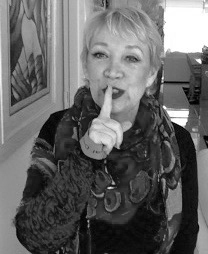 Sandy’s notes turned into a big story, so we’ve put it in 3 sections for ease of use for you – our intrepid travellers who look for good advice, that cuts the time and decision making for you. 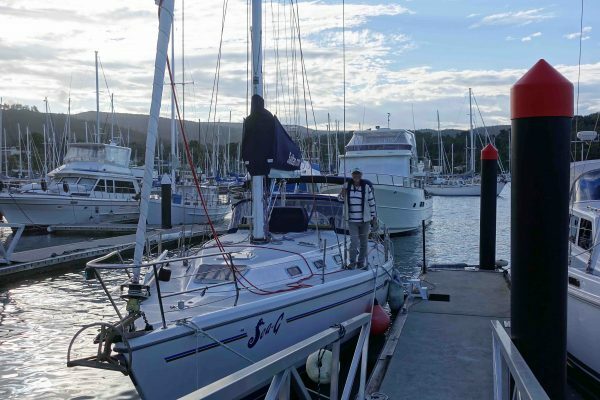 “We had a short half hour drive from Hobart to Shucker’s Retreat which would be our home-base for the next couple of weeks. I even saw my first wallaby on that drive, albeit it was a dead one. I wondered if I’d see a live one? We turned off the main road and navigated a few dirt roads before we came upon our house. 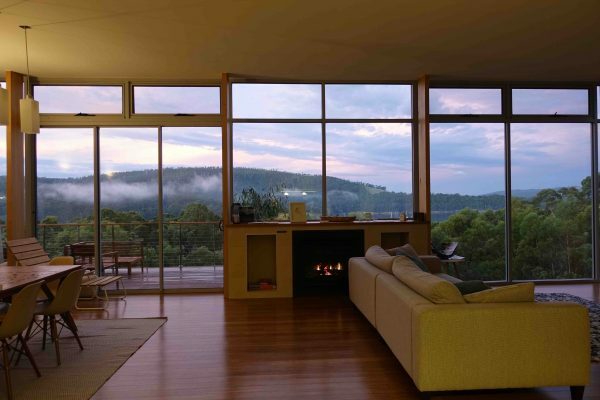 We’d chosen this house because of its view, and it didn’t disappoint. As we walked through the house I caught a glimpse of a wallaby through our bedroom window. I got so excited and took a video to share with folks back home. I thought I was so lucky to see one! Then we noticed there were about 12 wallabies in the yard. Wallaby sightings in Tasmania are not such a big deal! We cooked dinner from our fabulous market buys, taking in the stunning view of Oyster Cove through the wall of glass. As the sun was setting we sat down to our dinner of shrimp in a black garlic sauce with squid ink pasta. 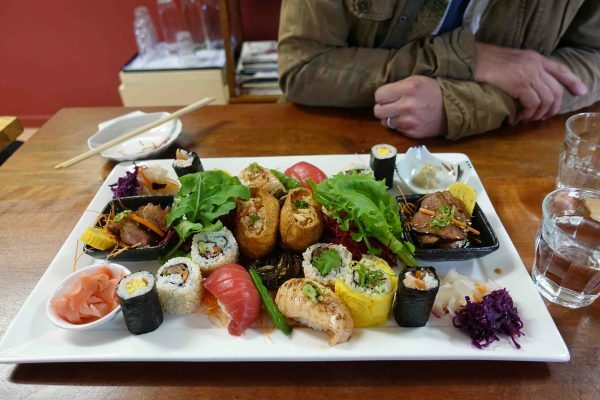 It was everything Tassie – sea, fresh produce and bright, fresh flavours. Exploring our area we trekked over the hill from Shucker’s Retreat to Kettering through the bush. 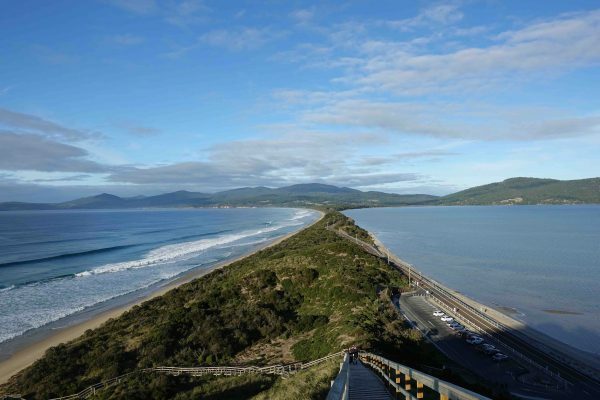 It’s a nice, long walk and we rewarded ourselves with a quick bite of fish and chips at Bruny Island Gateway. The marina is interesting, and we fortified ourselves for the trek home with a flat white and sweet treat at Steamhouse café. We woke up Tuesday to howling winds. (Not unusual from what I gather). 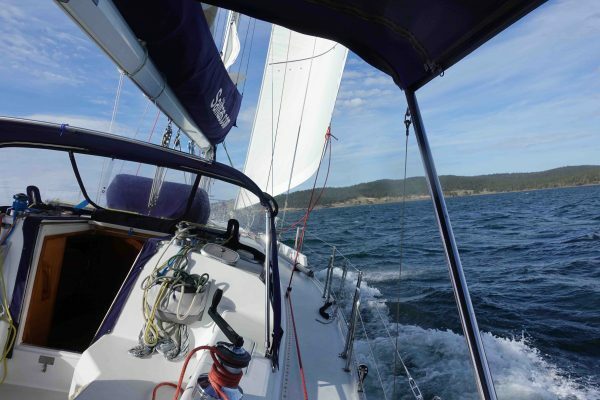 We had chartered a sailing cruise around Bruny and worried that the winds would scrub our plans. Our captain emailed to say the trip was still on so off we set. We met Captain James and boarded SeaG for our cruise. Thank goodness Captain James is a skilled sailor. We had 35km/h winds and hit speeds over 7 knots. It was hairy at times but thrilling! We found a nice little alcove and had a wonderful lunch of seafood chowder and a Hughes and Hughes Riesling. Now, this is where my obsession with Tasmanian Rieslings started – fruity, grapey goodness in a bottle. South of Oyster Cove lies, sleepy in the sun, Grandvewe cheeses – where we hoped to visit Ryan or Luke and learn more about his Sheep’s Whey Gin. We stopped by the tasting room and found out we were in luck. Luke was just finishing up for the day and would give us a tour! While we waited we had a sampling of their sheep’s milk cheeses and walked away with some of their Old Man and White Pearl. Delicious and different. 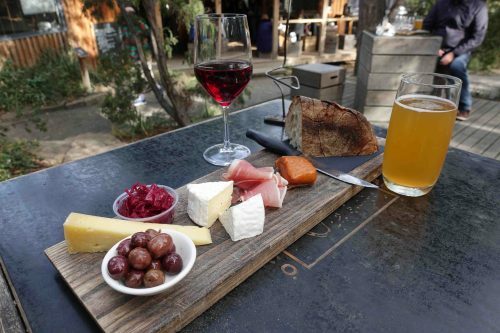 Cheese that is a celebration of craft and taste. The distillery at Grandvewe is actually outside and under the tasting room and café. It’s a much smaller operation than I expected. I actually didn’t know what to expect from a sheep dairy that’s using fermented whey as a base for gin and vodka. But it turns out these guys know what they’re doing. Luke and Dylan gave us a tour of the process where everything happens in a few square meters. There’s obviously a lot of TLC that goes into the spirits. Luke explained how each bottle is masked off, spray painted, hand labeled and signed. Luke and team really made us feel at home and gave us a fantastic tour of the distillery, milking room and cheese room. It was awesome to see such a young team doing amazing things and really enjoying what they do. Our second Sunday was wet. A visit to Cygnet’s market found it was unfortunately mostly rained out. We popped in for a quick pastry at Cygnet Woodfire Bakehouse and avoided a major downpour. We then used the small town’s welcoming butcher and grocery shops along Mary Street to pop in and out of the rain meanwhile picking up goodies here and there. We did manage to visit the few die-hard stalls at the market and were rewarded with an amazing duck and cherry pie. It was mostly a locals-only market but we felt very welcomed. Aubrey, a friendly local was very excited to talk to us about travel in the US and his love for 90’s grunge music. We even ran into the head cheesemaker and chef from Grandvewe Cheeses picking up their meat pies for the week! It’s a small world down here. 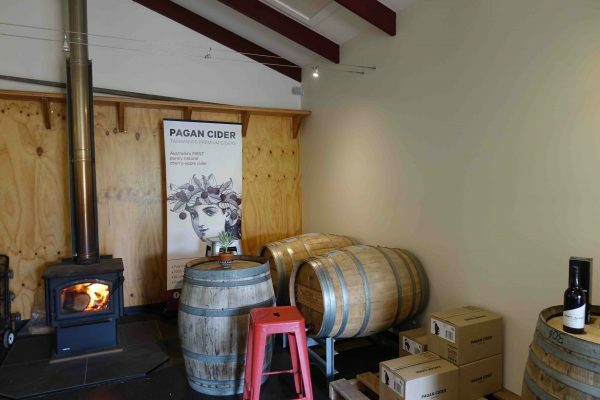 Heading up and over the Huon Valley to our lunch destination, we did allow ourselves a little detour and stopped off at Pagan Cider for a taste of their apple, pear and cherry ciders. Dry but fruity, a delicious inventive take on what I had thought of as just pop. Then it was onwards to Masaaki’s for sushi. You wouldn’t think much of the four-table restaurant at first glance but the sushi coming from Masaaki Koyama was a celebration. But I’m afraid that I disappointed the whole team there. It appears that when American Express made the reservations for us they gave my name as Sandra Black. Masaaki heard the name as Sandra Bullock. Whoops.After gorging ourselves on some of the best sushi I’ve ever had we decided to have a little digesif and made a stop at Willie Smith’s Apple shed. Out of all cider producers in Tasmania, we were surprised to find that only Willie Smith’s made the traditional Norman-style Calvados. They produce their Calvados in a Charentais alembic still, and it’s alcoholic sun in a glass. Monday, we headed to New Norfolk for lunch at The Agrarian Kitchen. The restaurant is housed in the Bronte building of Willow Court, the town’s old abandoned mental asylum. Set in hauntingly beautiful grounds the restaurant itself is very bright, airy and modern in a clean canvas kind of way; not pretentious or aloof. A Negroni and the Herbacious Cooler, which involved the house sloe gin, herbal kombucha and Maidenii sweet vermouth kicked us off. The food was different, exciting and exemplified everything about the paddock to plate movement. We had the raw lamb with pickled chilis, toasted buckwheat and mint. I think it was my favorite dish. Then we went to the fried sourdough potato cakes with ketchup. Don’t judge me. Who can pass up fried potatoes? 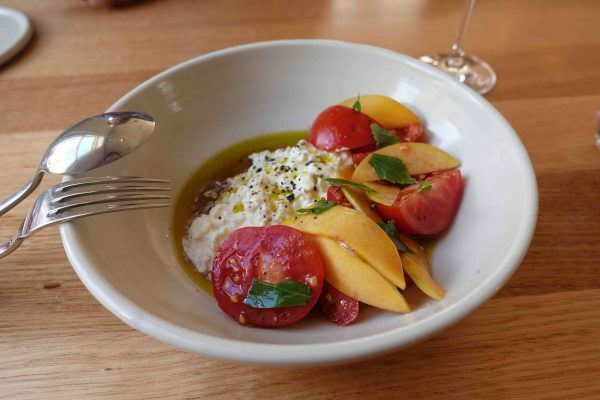 Next was a salad of ripe tomato, peach, lavage and house made stracciatella. We went overboard with the salads and followed the tomato dish with a bitter cucumber salad with cured green tomatoes, goat’s curd and fried almonds. Tagliolini with egg yolk, smoked trevally and parsley and then the wood roast suckling pig with roast quince, parsley and lentils were our mains. I can’t believe that we had room after that, but we did. We managed to eat our entire dessert of wood roasted apricot clafoutis with kefir cream and honey. A perfect finish and worth gorging ourselves. On the other side of the Derwent, a windy trip through beautiful forest and coast, lies Port Arthur. Southern Tasmania just keeps giving as a tourist destination. Really. We took a little detour on the drive down and stopped off to see the Blow Hole and Tasman Arch. (That’s our feature image just FYI). in Tasman National Park. A short easy hike brought us to some amazing cliff views. Before continuing down the coast to Port Arthur we had some surprisingly good fish and chips from the Doo Lishus food truck while shooing away the fussy seagulls. 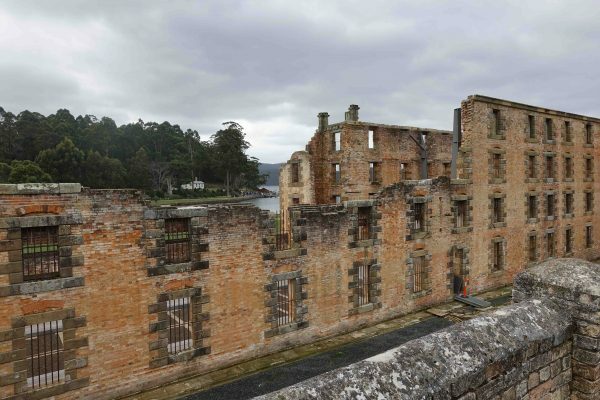 Port Arthur has a troubled past and is certainly on the somber side, but I think it was one of the unexpected highlights of our trip. I found it to be a very well done and respectful of the history, both old and new. The gardens are glorious and the recreations of their history, in tableaus spread over 30 buildings, ruins and houses is fascinating. 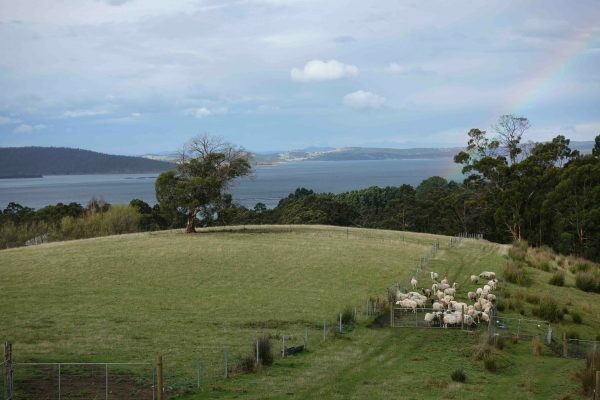 Before we left our Cygnet base, Bruny island and its delights beckoned. We rose early and caught one of the first ferries over to avoid the crowds. Our early rise paid off with a quiet hike on The Neck. Bruny Island Café for a quick bite and a latte delivers fresh and friendly, then it was off for more hiking. And keep your eye out for their final swirl before they head back to the big smoke!